Dear friends, I'm happy to announce that after months and months of searching, the wait is finally over. So much exciting news to share with you all. Yep, and with my new studio, we're also making some new changes. After many years of listening to you all, and your valued support, I hope you'll find these changes to your liking. As of March 1st 2017 my new business name is 5 Signatures Bindery. If you already follow on facebook and twitter, this change will be automatic for you. And.... I'm moving to a new site. Per popular request I've added a new "Build A Book" feature where you can request custom orders based on selection options of book cover, binding, and page options. Sign up on our mailing list for your first coupon!! When my son told me I had enough paper and stamp supplies to start my own craft store, he wasn't kidding. Last week, I opened the closet and realized there isn't an inch of room to store new supplies. Even as I cleaned it out and tried to re-organize my space, I knew I had it my maximum limit of paper, stamps, fabrics, and threads. So... it's time for me to let some of it go. I'm the one who wants to save everything because one day I may need it again, but not today. So as I sit and sort and decide what to keep and what to let go, I remind myself that every once in a while we all need to clean our closets. Get rid of the old and look forward to the new. I'm looking forward to the new and I hope you are, too. They say someone else's loss in another's gain. I've listed many of my older CTMH stamps on ebay along with paper packs and soon will be adding some fabric fat quarters to the listings and odd and end craft items like punches, beads, and the like. I've also got a stack of supplies, including some of my scrap papers, I'm planning to donate to a local pre-school to add to the kids art supplies. If you're looking for a particular stamp set or paper, let me know I'll check my stash. I'm doing a little cleaning up in the inventory closet this month. I've added a new category to the shop. BARGAIN BOOKS. All the guest books in the Bargain Book category are books 30% - 50% off regular price. These are the last ones of their design. Once these books are sold, they will not be available again in my shop. 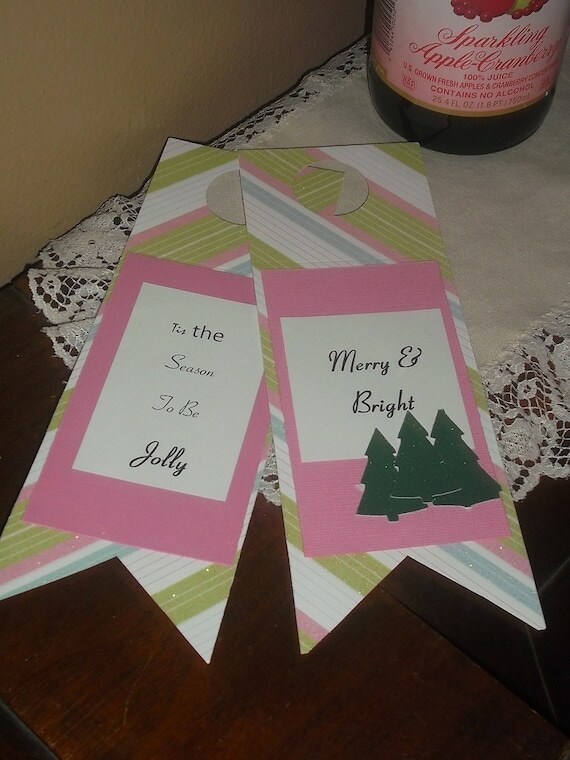 I've been such a busy bee lately and totally in the mood for this holiday season. 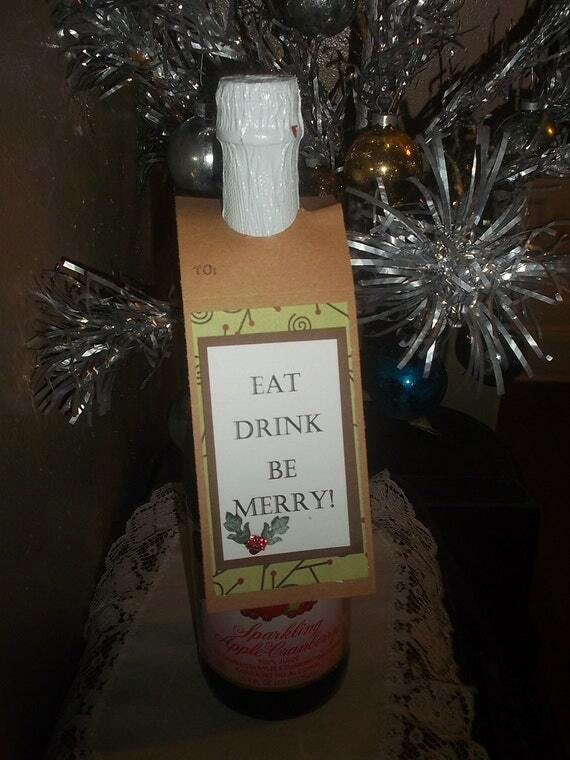 On a recent my mom and I crafted up these tags for wine bottles. You can also put them on bottles of olive oil. 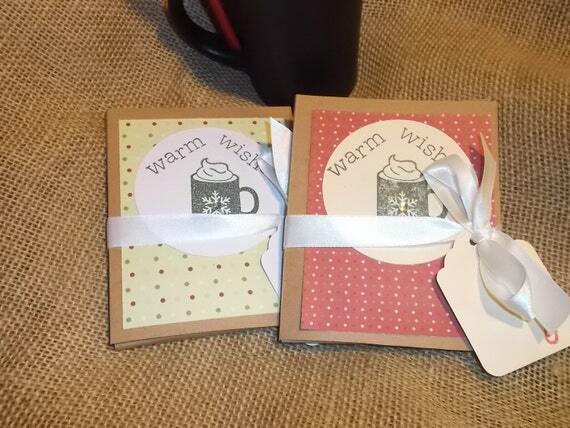 We created a variety of them that I have in the Cards and Tags section of the shop now. I'm also going to be including one as a gift with purchases over $20 from now till the new year. The kids will be getting out of school soon for their holiday vacation. Before they're off they like to give a little something special to their teachers and school bus drivers. 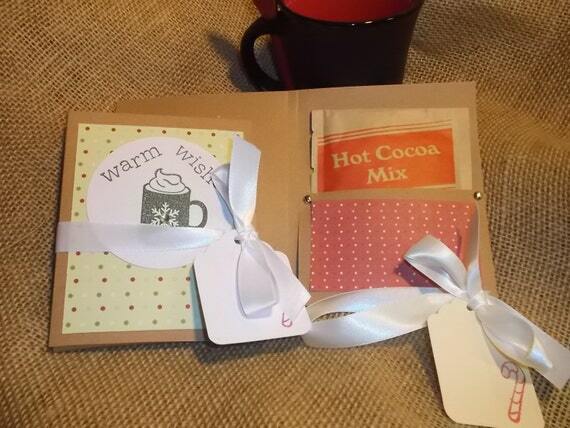 I love this idea I found through Pintrest and have added my own little alterations to these Hot Cocoa Gift Pocket Cards. We got carried away making them this past week and so they're are some available in the shop made up and ready to ship here. Due to the cost of shipping, you have your choice to receive them with or without the hot cocoa packet already in them. I can't wait for the kids to share these with teachers, school bus drivers, and even their friends. They're even great for a little something to share with your co-workers anytime of the year. It's getting close to Christmas, now, are you ready?